Posted on Wed, Mar 28, 2012 : 2:59 p.m. The Violin Monster is on his way back to Ann Arbor and he's planning a secret homecoming concert this Friday. Also taking place Friday night is the second annual FoolMoon festival downtown, the kickoff to Sunday's FestiFools event on Main Street. The Violin Monster on Main Street in Ann Arbor last summer. 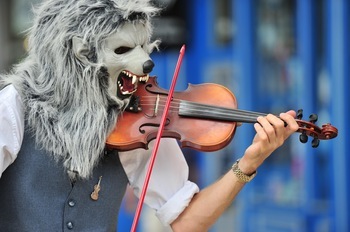 Will the street violinist in the ghastly werewolf mask be found howling at the moon Friday night? You'll have to sign up on ViolinMonster.com to find out. Zachary Storey, the Ann Arborite behind the mask, gained local fame as a full-time busker in Ann Arbor last summer. He took his show on the road several weeks ago to escape the wrath of Michigan's winter and found himself traveling the United States coast to coast. After spending time in Boston, New York, Charlotte, Atlanta, New Orleans, Austin, San Antonio, Houston, Los Angeles, San Francisco, San Diego, and Memphis, he's fiddling his way back to Ann Arbor. He talks about his winter sojourn in a new blog post on DamnArbor.com, citing performances at Mardi Gras and at the South by Southwest festival in Austin as two of the highlights. He said he met a number of Ann Arborites and others from Michigan during his journey. "I was always pleased, surprised, and filled with warm feelings when it happened," he said. "And of course, whenever they made it known that they were from Ann Arbor, I played 'Hail to the Victors.' I always wrote 'traveling from Ann Arbor, Michigan' on my sign, so even U of M alums who have never seen me in Ann Arbor sometimes came up to me and chatted." Ryan J. Stanton covers politics and monsters for AnnArbor.com. Reach him at ryanstanton@annarbor.com or 734-623-2529. You also can follow him on Twitter or subscribe to AnnArbor.com's email newsletters. Thu, Mar 29, 2012 : 2:50 a.m.
FYI, wearing a mask on the streets of Ann Arbor is illegal. While the guy might be entertaining to some, he's knowingly breaking the law (and, yes, I have experienced him being told so by local police). Thu, Mar 29, 2012 : 1:28 a.m. The fundamental question: Is he worth listening to, or is he just another pretty face? Wed, Mar 28, 2012 : 7:30 p.m. What?! I didn't know he was missing.. I didn't permit this absence. An OUTrage I tell you.. Wed, Mar 28, 2012 : 7:17 p.m.
Hey! We missed you man! I'll keep my eye on Main St. Welcome back.